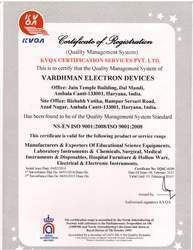 We Vardhman Electron Devices, began our operations in the year 1957, as one of the leading manufacturers, exporters and suppliers of this commendable range of Scientific & Medical Equipment. The Range made available by us in the market, is made up of the finest Glass Syringes, Sunproof Car Covers, Dairy Equipment and many more, having a high preference in the market. Making of this range is done as per the set industry norms and guidelines, utilizing the finest raw materials and modern machines, this ensures the product’s performance and longer service life. In addition to this, the range is marked at the most reasonable rate possible. Our highly advanced state-of-the-art infrastructural facility, laced with all the necessary machinery and equipment, helps us in the attainment of several of the firm’s predefined goals and objective. The facility regularly upgraded, facilitates the extension of our reach in the market. For reasons of managing the operations of the firm in the best possible manner, the facility has been parted into a number of highly operational units. In addition to this, our ethical working habits have helped us generate a huge client base. We export our products all over the world. Under the leadership of our Sr. Manager, Mr. V. K. Jain, we have managed to attain of greater heights of success. His ability to guide, manage, make decisions and understand the market has helped us generate a smoother path to glory. Further, he provides regular perks to the employees, for reasons of keeping them motivated and satisfied. Trading of Scientific and Medical Equipment. We ensure to manufacture high quality standard production. We use sophisticated testing methods to make sure that only the best of our products reach the clients. Therefore, our range of scientific and laboratory equipment undergo several quality tests, before approving them for the next stage of development. We use high grade raw material such as iron, aluminum, silica and wood procured from trusted vendors to ensure high performance in the final product. Our quality controllers undertake stringent inspections to maintain the credibility of our range in the market as these are used in health care units, research centers and institutions. We are backed by well-developed state-of-art infrastructure, which enables us to complete the ordered consignments within the stipulated time. We have all requisite facilities to manufacture our range of scientific and laboratory equipment in compliance with the international quality standards to ensure durability, reliability and accuracy in the final product. In addition, we also are supported by a modern in- house design unit, which assist us to design and develop these products as per the specific requirements of our clients.